My man and I headed out into the city to play tourist, “toerist spelen in eigen stad” as we say. A little tired but excited to see what an expectedly lame tourist attraction would offer us. We cued up in the line that I passed a thousand times before wondering why all these people so desperately want to see Madame Tussauds. 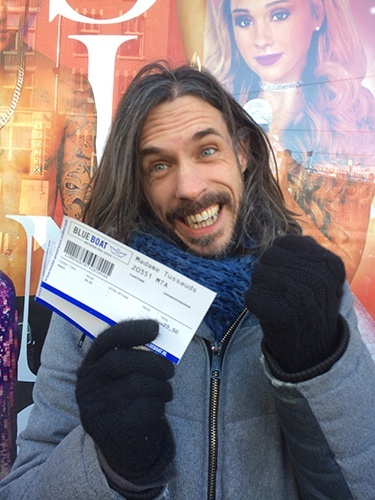 It was a cold, sunny day and as we complained having to line up in the shadow a friendly guy in a funny suit told us we didn’t have to line up when we bought our tickets already! 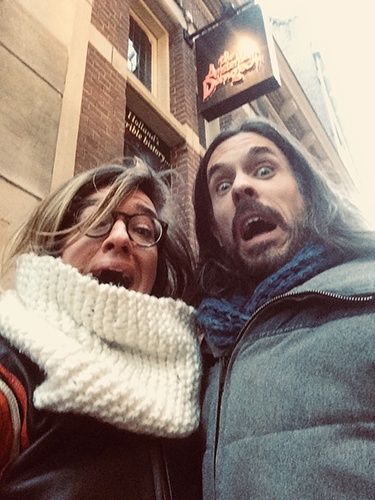 Madame Tussauds was unexpected: we had fun! After a chat with our former queen, taking a seat on the throne ourselves and meeting George Clooney, we had a nice cheap coffee in the ‘club’. While listening to our own world famous DJ’s. I was surprised to find out you are allowed to touch the puppets and there’s interactive stuff to do. 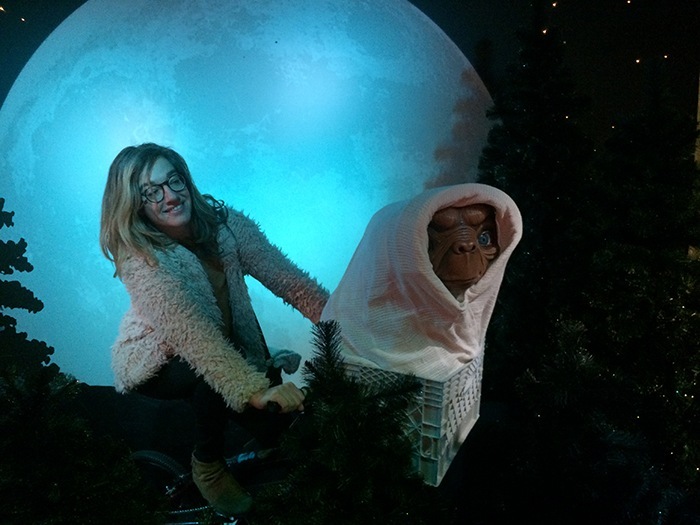 So I sang Adele Karaoke, rode a bike with ET and checked out a virtual reality DJ set. At some point I lost my man, I think he should have a puppet at Madame Tussauds as well, don’t you think he looks more handsome than Johnny Depp? Click here for more information on Madame Tussauds. if you go, hide as much as you can, wear something grey or colorless, no perfume, no sweat. Don’t talk too loud, don’t laugh too loud. Or you’ll be noticed and punished! Click here for more information about The Amsterdam Dungeon. Amsterdam. 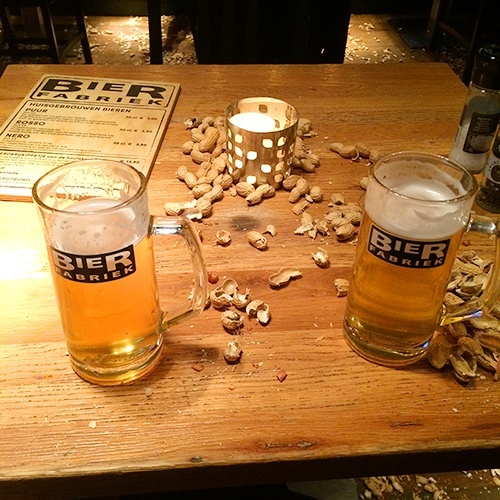 Nuts spread all over the floor as these are served with the beers, a generous gesture. We tried the Puur beer, unfiltered and unpasteurised beer: pure beer (as the name suggests ;). Tasty and a great way to chill out after this crazy Dungeon experience. We had some veggie sticks with humus, which turned out to be carrots, cucumber and humus. Not very exciting, but thankful we where this took us back to the normal, sober world without blood and with healthy food. Although we experienced some sickening stuff that may have reduced our appetite, after one Puur beer, and the cucumber, we felt hungry again and we devoured the charcoal BBQ chicken, very tasty and crispy. Great little tour! Tip: combine your tickets for Madame Tussauds, The Amsterdam Dungeon and Beer Tasting Amsterdam with a City Canal Cruise / Kids Cruise / The Amsterdam Canal Cruise and receive a discount of € 2,50 on EVERY ticket. Just add the tickets to your basket and the discount will automatically be applied.